30 MMS March 2017 mmsonline.com RAPID TRAVERSE Machining Technology in Brief year's International Manufacturing Technology Show (IMTS) via networked machines displaying process and per formance data on monitors throughout the company's booth on machine controls and wireless mobile devices. Equipped with 5ME's Freedom Gateway and Freedom Edge software, the machines can trans- parently report current state, cycle times, delay times, part counts, gaging data, events, and many other data points needed to evaluate OEE, future maintenance needs and process performance. 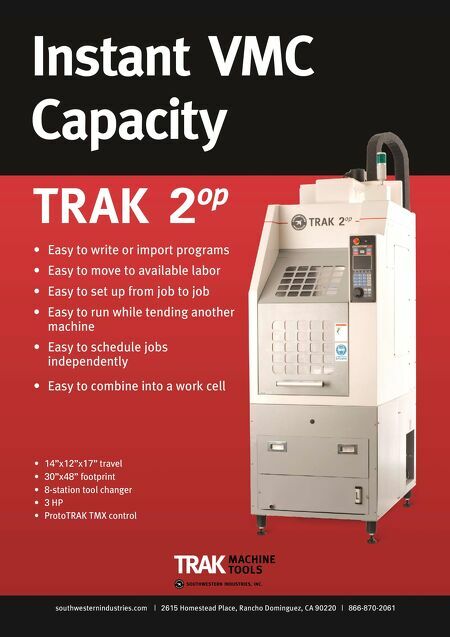 The Freedom Gateway device is integrated with the machines' controls and provides a secure gateway to an Ethernet network for local sharing of machine data and visualization of manufactur- ing metrics. It includes multiple Ethernet ports, VGA/HDMI ports, built-in Wi-Fi, digital and analog i n p u t a n d o u tp u t a n d a n ex p a n s i o n s l ot fo r Fieldbus cards. 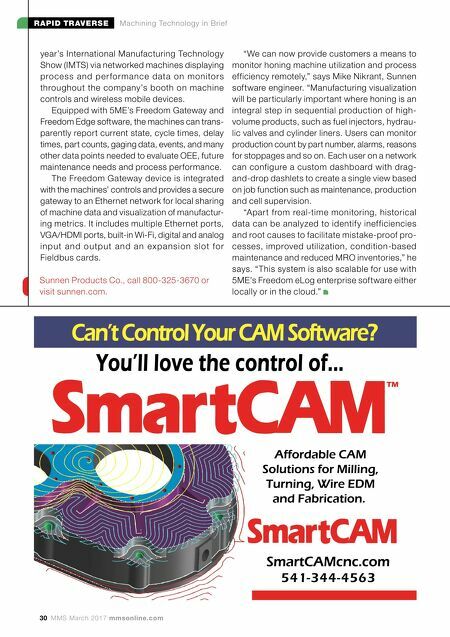 "We can now provide customers a means to monitor honing machine utilization and process efficiency remotely," says Mike Nikrant, Sunnen software engineer. "Manufacturing visualization will be particularly important where honing is an integral step in sequential production of high- volume products, such as fuel injectors, hydrau- lic valves and cylinder liners. Users can monitor production count by part number, alarms, reasons for stoppages and so on. Each user on a network can configure a custom dashboard with drag- and-drop dashlets to create a single view based on job function such as maintenance, production and cell supervision. "Apar t from real-time monitoring, historical data can be analyzed to identif y inefficiencies and root causes to facilitate mistake-proof pro- cesses, improved utilization, condition-based maintenance and reduced MRO inventories," he says. "This system is also scalable for use with 5ME's Freedom eLog enterprise software either locally or in the cloud." Sunnen Products Co., call 800-325-3670 or visit sunnen.com.